how's this sound? all expense paid trip to Vegas! i'm going. me. uh-huh! Addie sent me an email this morning asking what i was doing this weekend. i told her i had plans for cousin's baby shower. she told me her aunt backed out of their (her and her mom) trip to Vegas and they need a third. after some hemming and hawing and IM'ing HM. it was a done deal. in two hours, i had a ticket, boarding pass, and the day off tomorrow. 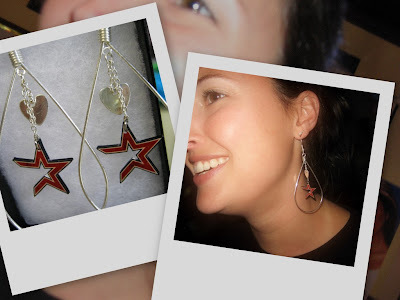 SBW wanted Astros earrings. they came out really cool. don't even ask for a pair of your own. they were a beeyoch to make! listen to the best of the Across The Universe soundtrack over on the sidebar. Addie: what are you doing tonite? me: i have to find something to wear to the shower tomorrow. i'm making S1 go to the mall with me. i hate going to the mall. Addie: yeah, i know... cuz you don't like your weight right now and feel uncomfortable trying on clothes. me: uhm.. no, actually. it's cuz i just really hate the mall, but thanks for getting my low self esteem back in check, Dr. Addie! we were both cracking up for the next 20 minutes, just thinking about that over and over again. definition: watching a movie with the karaoke machine your niece left at your house. Woz came over last weekend and we finally watched watched Across the Universe. not bad. not bad at all. great soundtrack. Evan Rachel Wood.. her voice.. when she did "If I Fell"... like buttah! anyways, HM had the idea that we amp it up a bit... with the karaoke machine and 2 mic’s! totally worth it! it takes it to a whole new level. i don’t think i can ever go back to watching a musical-ish type movie without the mic’s again. next up: Purple Rain fo sho! not my other favorite song... that one was pretty ghey anyway. this one's definitely got some kick to it and i totally remember us trying to get those dance steps down! p.s. check out Finola Hughes at 1:05, pre General Hospital days, in her movie debut. what the hell was wrong with us?? S1 and i watched this movie over and over and over on HBO. we also watched alot of Sgt Pepper's Lonely Hearts Club Band. were we normal children of the 80's? did every 80's child like super cheezy musical movies?? i have to know! i know it was last month. whatever. this is a video of the annual Barcycle ride on the island. basically, a pub crawl for St. Patrick's Day. good times! i had a blast with SBW & Durty and i got to hang out with some peeps i haven't seen in a while. barcycle 2008 from islebehere on Vimeo. only because i haven't downloaded all the video. not that there's a whole lot of video to download, but it's some. mostly of the band. oh and guess what? NOBODY got video of me singing with them!! can you believe?? the best video is of the nite before anyway. wait'll you see all that!